At a Language Learning Center, UCF students are helping immigrants in Central Florida learn English and life skills. Every Thursday evening at 6 p.m., a small group gathers in the cafeteria of Maitland Presbyterian Church. Their reason for coming together has nothing to do with faith or religion. At first glance, they have little in common. Members of this particular group hail from Ecuador and Columbia, Haiti and Puerto Rico, France and Hungary. They speak Spanish, Creole, French and Hungarian. What they share is a desire to learn to speak English, which they are practicing with volunteers — many of whom are UCF students. The Church’s Language Learning Center was started in November 2016 to address a need in the community for a growing immigrant and refugee population in the area, says pastor Megan Collins. The program runs from August through May with monthly subjects focusing on topics that are useful in everyday life, such as finance, transportation, health and education. Unlike other language assistance programs, the center serves people who speak any language, rather than just one, and provides specialized assistance from volunteers at the start and end of each class. The lesson plans also includes some real-world practices, such as the annual field trip through Winter Park that allows students to learn how to use public transportation. Shortly before the program celebrated its two-year anniversary, Al-Shabibi took over leadership of the center. 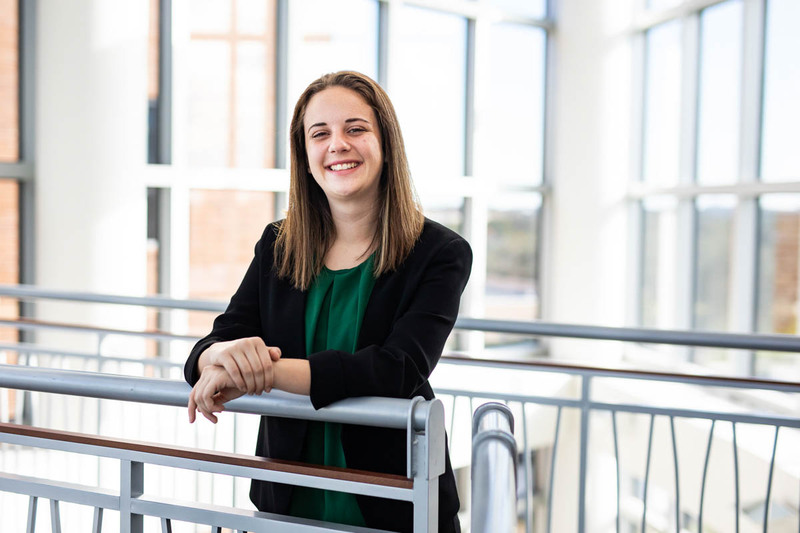 She started volunteering there in 2017 after learning about the opportunity through the UCF chapter of the National Student Speech Language Hearing Association, a pre-professional organization for students within her field. For years, the association has provided members with opportunities to work with local elementary school students with autism spectrum disorder or Down syndrome. When the center reached out to the organization looking for volunteers, it was natural for its members to become involved. Buford started volunteering in November and typically does so three times a month. Most recently she’s been working with two brothers, ages 13 and 11, from Mexico. But most often she works with young adults who want to learn English to find jobs and provide for their families. Buford has had her own challenges with adjusting to life in a foreign country. In November and December, several students from UCF’s College of Medicine partnered with the center to lead sessions on nutrition and health. Lessons included how to find healthy foods at the grocery store, how to access healthcare services in Orlando, and even practicing how to talk about medical issues or concerns with practitioners. These are part of the reasons Mankbadi was interested in volunteering with the center, but his main motivation was to use his expertise to give back to the community. In turn, he’s become more mindful of how culture can impact medical treatment, and he’s working to line up UCF volunteers to assist with the center’s nutrition and health units at the end of 2019. No matter the level of their English skills, students are always welcome to the program. Some have arrived in the United States just days before their first session while others have been living in America for years. One dedicated student is Véronique Benouaich, who lived in France until she married and relocated to Florida five years ago. Benouaich practiced physical therapy for more than 20 years in her native country. With a new start in the U.S., she’s taken to pursuing a passion she’s always had: art. Benouaich volunteers at the Albin Polasek Museum in Winter Park and runs an art gallery selling works from Parisian artists out of her home. Since Benouaich started attending the center in September, Al-Shabibi says she’s improved greatly because she’s a dedicated learner. That quality has also helped Benouaich in her role as a teacher, which she fulfills as a French tutor to local middle and high school students. She even assists with new students at the center who are fluent in French. “[Attending the center’s classes] helps me to explain to others in English the different grammatical issues in the French language,” she says. Benouaich knows that teaching others another language requires a lot of patience, which Al-Shabibi has a lot of, along with a welcoming friendliness that makes many of the students at the center feel comfortable. Al-Shabibi balances her easy-going nature during weekly classes with disciplined organization throughout the week to fulfill the program’s administrative needs, such as developing lesson plans, connecting with current and potential students, and applying for grants. She does this on top of managing her own studies and a teaching-assistant position at a K-12 school. But she’s looking to do even more with the program by advocating for more initiatives like this in Central Florida. “If we could have something like this [program] on every street corner then it would be doing its job,” Al-Shabibi says. “You’re dealing with people who may not have a car, who may not know how to use public transportation or who may have to walk. So when it’s difficult to get here, they won’t come. After she graduates in the fall she hopes to stay on as director at the center, working full-time to further its mission. But even if more programs like this develop throughout the region without the center’s name, she says she’d be happy. In fact, she welcomes the idea of more organizations and people in the community helping others who are making their homes here. “You don’t need a lot to start it. You need a couple good people, good conversation and a passion for helping,” Al-Shabibi says.